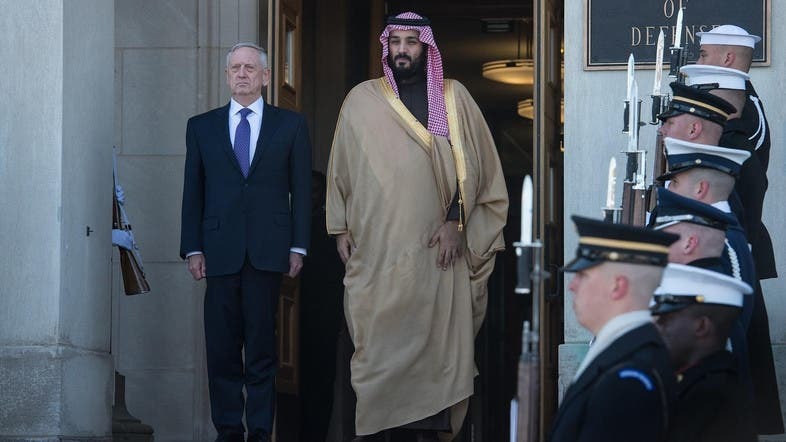 Saudi Deputy Crown Prince Mohammed bin Salman bin Abdul-Aziz, who is also the Deputy Prime Minister and Minister of Defense, met in his office in Riyadh on Wednesday with US Defense Secretary James Mattis. The meeting discussed bilateral relations and opportunities for improving them and pledged to develop programs and initiatives between the two countries. During the session, the two sides discussed the challenges facing the region, especially the hostile practices of the Iranian regime and its role in destabilizing the security and the stability in the region. Prince Salman and Mattis also emphasized the need for joint efforts in combating terrorism and extremist groups such as ISIS and al-Qaeda. The meeting also discussed joint efforts to maintain the security and stability of the region in general, including the navigation routes and water crossing fords. The meeting confirmed a convergence of approaches between both sides and a firm desire to continue joint efforts to achieve security and stability in the region.